Steve Kean will begin the new Championship season as manager of Blackburn Rovers, according to the club's new global advisor Shebby Singh. 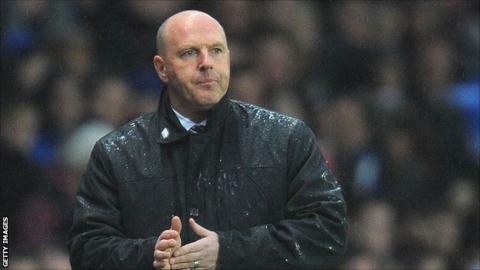 He told BBC Radio Lancashire: "At the moment, Steve Kean is in charge and I fully expect him to start the season." Rovers' 11-year stay in the top flight came to an end with relegation in May. Kean and owners Venky's have been under increasing pressure from Blackburn supporters since he replaced Sam Allardyce as boss in December 2010. It appears the 44-year-old, who flew to India for several days of talks with Venky's at the end of the season, will be given the chance to try and lead Blackburn back to the Premier League at the first attempt. Singh, a former Malaysia international during his playing career, has been working as a football pundit in Asia in recent years but was appointed by Blackburn earlier this week. His support for Kean contradicts the views he expressed in a column for the New Paper in Singapore last month, when he called for the Scot to be sacked. "Looking from a football pundit's point of view, Steve Kean is obviously not the man to lead Blackburn Rovers back to the Premiership," he wrote. "There were too many areas that weren't looked into this season and we can talk about this for a long, long time. "Firstly, they were tactically naive with a lightweight team that were too easily brushed aside at times. Then, there were a number of players who were past their prime. "There were also players, such as Grant Hanley, a centre-back, who were played out of position, while there were a number of unhappy players at the club, such as Chris Samba. "But there's no use wallowing in self-pity and the club need to move on quickly." When asked about those comments, Singh said: "My view as a football pundit was to look at it from a critical point of view. Now, as the [club's] global advisor, what I need to do is to be constructive with my views. "There are areas I think I was right and we can work on those areas. "I have an opinion about Blackburn Rovers as a football pundit. I have an opinion and a responsibility, as the global advisor, to put my money where my mouth is and try to help the club."